Looking for a gift that stands out? Spirit carries products that enhance spiritual practice, transform the home into a sacred space or simply brighten a loved one’s day. 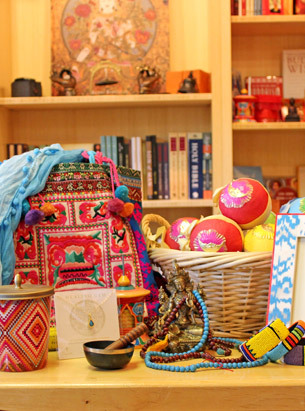 Spirit has a wonderful collection of fun and beautiful treasures and accessories that spark a greater connection to the transcendental. We also offer exquisite items for seekers and non-seekers alike. From delightful and creative presents for children, to beautiful jewelry and scarfs and bags, to candles and home accessories, one can find something for everyone. Gift items at Spirit include handcrafted jewelry by Annie Band and Daniela Botur’s Aromaje flower essence infused crystal adornments.